The Atlas Learn AL2430 system is an in-classroom sound reinforcement solution designed for use in K-12 and higher education facilities or where a room constrained public address system is required. This complete audio enrichment package consists of amplifier/ receiver, two wireless IR microphone transmitters, docking charging station for the two transmitters, and two Infra-red dome ceiling sensors. System is designed to allow teacher and students to walk freely around the room with the infra-red microphones control units and project their voices through installed speakers. Speakers not included with kit. An ideal solution for large classrooms where two microphones are required. One AL2430 two channel amplifier/receiver, with four auxiliary audio component inputs. 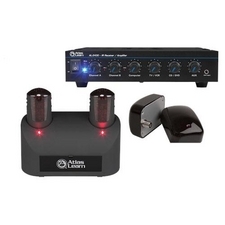 Two wireless IR wireless microphone transmitters. One dual microphone docking / charging station. A security output designed to tap into existing intercom for security alerts.